Cryptococcal meningitis is a non-contagious, opportunistic infection that occurs when the meninges tissue covering the brain and spinal cord get infected by certain fungus. Other body parts, such as the lungs, kidney, bone marrow, urinary tract, lymph nodes and skin, may also be affected. The disease is usually caused by the fungus, Cryptococcus neoformans, (present in the wastes of birds such as pigeons, as well as in soil), and rarely by Cryptococcus gatti (commonly found around eucalyptus trees). The mode of transmission of C. neoformans is through inhaling dust particles contaminated with dried bird droppings, with the fungus mostly affecting individuals having a weak immune system. The C. gatti fungus, on the other hand, may infect anyone. Antifungal medicines such as amphotericin B, along with flucytosine may be prescribed, with the dosage continuing for two or more weeks, as necessary. Close monitoring by the doctor is often necessary to check for any toxic effects on the kidney (nephrotoxicity). Amphotericin B may be replaced by fluconazole, if spinal fluid tests (for CM) taken in two consecutive weeks show negative results. Fluconazole may be substituted with other alternative antifungal agents such as Itraconazole or Voriconazole. In case of IV therapy, amphotericin B is combined with an antifungal medicine called 5-flucytosine and inserted intravenously. Some patients with raised intracranial pressure may undergo a lumbar puncture to drain excess spinal fluid to reduce the opening pressure. However, more research needs to be done in this area. Glucocorticoids, such as dexamethasone, may reduce the possibility of blindness associated with the disease. For pregnant women who have CM, the usual drug of choice is amphotericin B as it is safer than the azole drugs, like fluconazole, itraconazole and ketoconazole, which may induce birth defects. Although it is not possible to prevent initial exposure to the fungus, taking a few measures may help people more at risk of developing the infection. The drug, fluconazole reduce the chances of CM for those with CD4+ counts less than 50, but long-term use can have side effects, like thrush, vaginitis or candida infections since these yeast infections are resistant to fluconazole. With AIDS patients, its incidence lies between 2-7 cases per 1000 people, while amidst non-HIV-infected people, it occurs in 0.4 to 1.3 cases per 100,000 people. The ailment is more prevalent with adults and adolescents than children (found in less than 1% of all HIV-affected children). Most patients improve with adequate treatment. Recurrence may be prevented by continuing the antifungal drugs. It has a mortality rate of around 10% and chiefly with those with HIV. In Sub-Saharan Africa, the death rate of AIDS patients having the disease is around 50-70%. Research is being done to develop a vaccine to prevent the ailment. 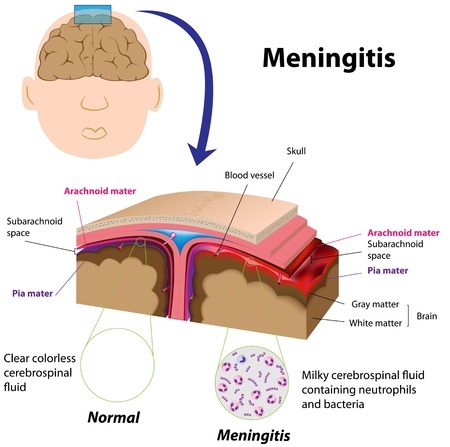 The ICD‑CM‑9 code of cryptococcal meningitis is 321.0, while its ICD-CM-10 code is B45.1.